“As Auckland grows every open space which is preserved for the use of the public is an asset of incalculable value,” a writer said in the NZ Herald in 1914. “Every city, in order to keep its inhabitants healthy, must have breathing spaces for the adults and playing grounds for the children.” Few of those spaces, it seemed, compared with Waikōwhai Park, Auckland’s newest, beautiful reserve on the shores of the Manukau Harbour. 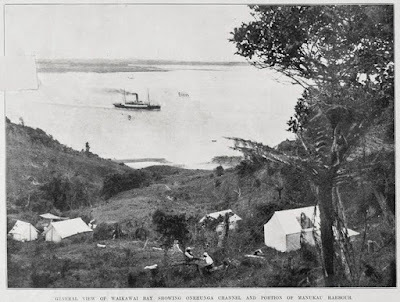 General view of Waikawai Bay, showing Onehunga channel and portion of Manukau Harbour. Auckland Weekly News, 1902. Sir George Grey Special Collections, AWNS-19020227-8-2. The land had been purchased from Māori in the 1840s, and a decade later, nearly 500 acres was granted to the Wesleyan Mission. Used for camping and fishing, its location on the outskirts of the isthmus was perfect for a public reserve. In 1911, the Waikōwhai Park Act was passed: a collaboration between the Mt Roskill Roads Board and the Wesleyans (who gifted a portion of the land for the park). Both the central Government and the Roads Board came up with the finances to create it, including grading the roads for motor vehicles to use, and laying a two-mile long water main for picnickers. On February 28, 1914 the Park was officially and ceremoniously opened. The Hon, F.W. 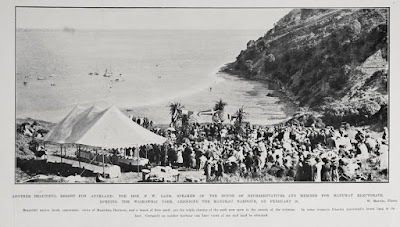 Lang, speaker of the House of Representatives and member for the Manukau Electorate, opening the Waikowhai Park, adjoining Manakau Harbour, on February 28. Auckland Weekly News, 1914. Sir George Grey Special Collections, AWNS-19140305-39-1. With its profusion of Kōwhai, Waikōwhai Park covered 50 acres and offered much for Aucklanders to enjoy. The NZ Herald summed it up: “Patches of bush alternate with undulating grass which is here and there cut up by picturesque creeks. Sheltered picnic spots are numerous and there is a special area laid out for camping and games. The sea frontage extends for three-quarters of a mile. Bold, rocky promontories alternating with pretty sheltered coves, make an attractive coast line.” Day trippers could fish and gather shellfish, swim in the harbour (changing sheds provided) and from all points take in the magnificent view over the placid water of the Manukau Harbour. Transportation to get to the park was catered for as well. While one could catch a launch from Onehunga Harbour, there were bus services. A regular service ran from Customs Street in the city, via the Domain and Cornwall Park, and on one occasion, staff from Rendells department store travelled by buses to the park for an afternoon sports event where the beauty of the new park was commented on with pleased surprise. And there were, of course, motor vehicles, able to drive close to the beach while passing through beautiful portions of the park. Beauties of Waikowhai Park. View taken from just inside the gates of the recently-opened park at Mount Roskill, Auckland. Auckland Weekly News, 1914. Sir George Grey Special Collections, AWNS-19140312-44-2. Frederick George Radcliffe. 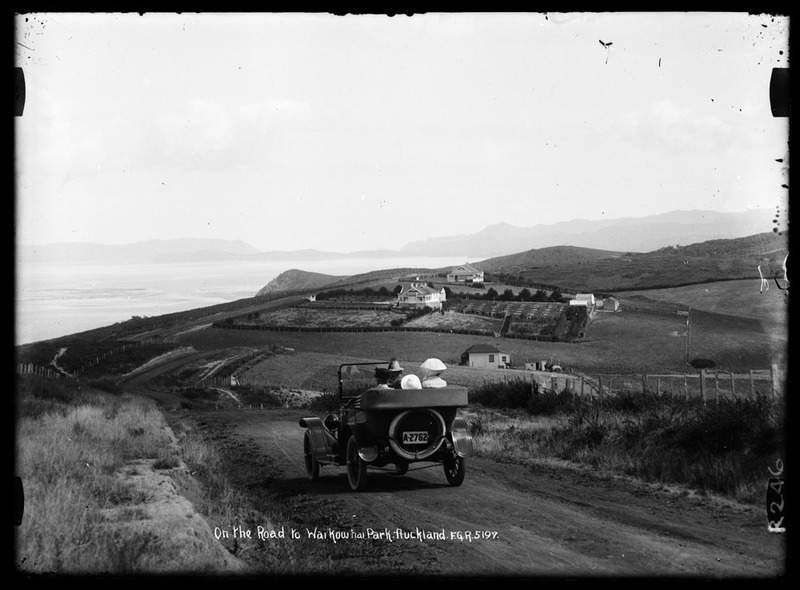 Looking south south west from Waikowhai Road across Manukau Harbour towards the Manukau Heads, 1915. Sir George Grey Special Collections, 35-R246. By the 1960s, though, part of the park was reclaimed for use as a rubbish tip. 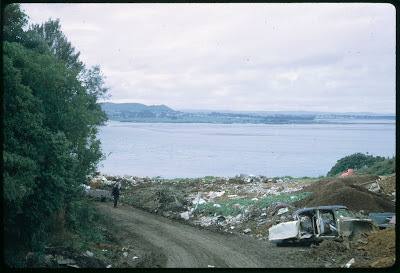 From 1962 to 1972, it became the landfill for waste, not only from residents (including septic tank effluent) but also industrial waste from freezing works and tanneries. As a 2015 Heritage Study on the Waikōwhai Coast noted: the tip would scar the bay for decades to come and contribute to the pollution of the Manukau Harbour. Waikōwhai Park tip. 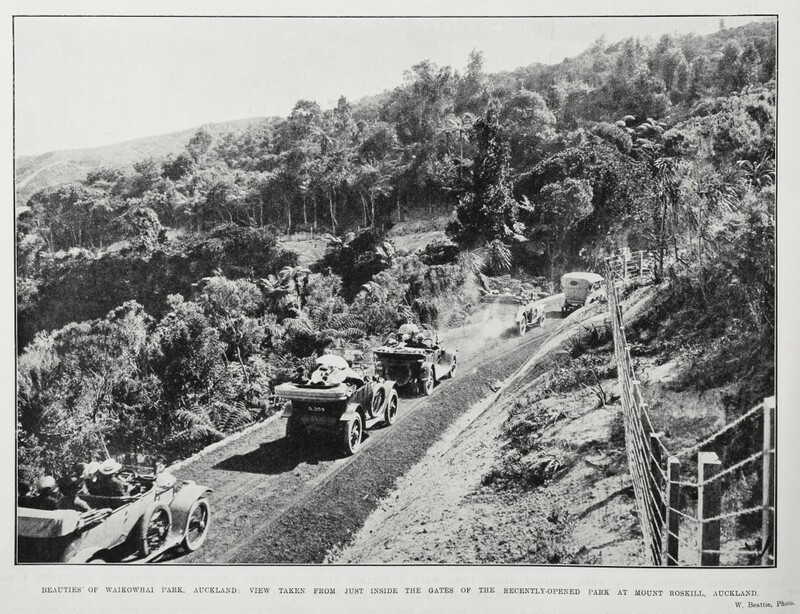 Auckland Council Archives, MRB 009-243. Today, while the park no longer has the prestige it once did, much is being done to resurrect it. Native bush is regenerating, the foreshore is undergoing restoration, and a project to construct a boardwalk has begun. Aucklanders can also admire the landscape and the Manukau from the 10km Waikōwhai Walkway, just one link in a chain of New Zealand-wide walks.